Hello everyone, and welcome back to my page. I hope you all had a good weekend. This past weekend I participated in the SCG Open in Cincinnati, Ohio. I live about 45 minutes from the venue, and that (as well as my enjoyment of Modern) was the primary reason I chose that instead of Eternal Weekend in Pittsburgh. While I wish I was at Eternal Weekend I did get to hang out with some friends which made the event enjoyable. Before we get to the deck I did notice a few things about myself that occurred. The first was my impatience. If I’m going to pay for a tournament like that I should play it out until the day is over, or until I get a bye (whichever comes first). After encountering Eldrazi Tron round 5 I was ready to pull the plug, and head to side events. My personal feeling on that match interfered with my enjoyment of the game. I can’t let that happen. The second thing that happened was during the Modern Challenge. I forgot to play a land before playing a spell. In this case it was Rest In Peace, and my opponent was on Grixis Death’s Shadow. That Stubborn Denial cost me the tournament (not just the match). These are things I need to work on, and things many other players do. We are only human afterall. Ok…now that is out of the way…on to the deck. This is not a deck that can capitalize off of Snapcaster Mage very well. Path to Exile, Mana Leak, and Cryptic Command are the primary spells used Game 1 with him, but it didn’t feel like those situations happened often enough to warrant 3 copies. 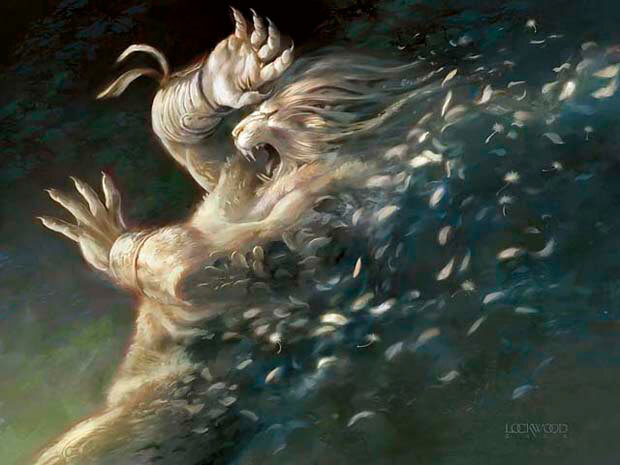 Having a Vendilion Clique in the main deck, and cutting Snapcaster Mage back to 2 copies, would also provide an evasive creature as well as provide some knowledge of the opponent’s next few turns. Although I was 8-1 against the clock (went to time once) I would like a way to help win Game 1 as often as possible. This was awesome. I was able to take his next turn, and although he drew a Liliana of the Veil (using it to edict his own Emrakul) it felt like a win-more situation. I feel going forward cutting 1 for a Think Twice might be better. There were times I had no cards in hand, and being able to dig further into my deck (plus doing it at instant speed) would be beneficial than having another Jace. I like Geist. I really do. 6 damage is A TON, but it seemed like everytime I played one, my opponent played a non-flying creature so I could not attack. Also during my Eldrazi Tron match my opponent, after I used Spreading Seas on a Tron land, was still able to cast a Thought-Knot Seer using Cavern of Souls + 2 Urza Lands + an Island. Spell Queller would have shined here big time over Geist. Now this one may seem strange, however hear me out. Take a look at my matches. Only two of them would even have 4 lands in play at a time. Sometimes not often enough, or in situations where I had the advantage as they flooded out. Being able to, on turn 3 on the play, strip the opponent of a key land can help turn the tide. We could also use this as a pseudo fetchland in order to fix our manabase to cast Cryptic Command, or Supreme Verdict, reliably on turn 4. I know many of you may not like this as it’s not traditional, or Ghost Quarter, however this deck requires a steady flow of spells & lands to execute it’s game plan especially with the curve topping out at 5. Being able to make your opponent stumble on lands early can buy you the time to play answers (or threats) turn after turn as you look to close out the game. Overall the deck was fun to play, and I could still make changes to the deck (most notably the Sideboard) as I continue to learn the matchups when I pilot this deck. If you want to control what the opponent does each turn, and win via Planeswalkers, then this would be the deck for you. So there are my thoughts on the deck, and what I will be changing based on results lately. What do you think? Share your comments below, and make sure to follow me on Twitter as well as Facebook. Next Isn’t it Iconic, don’t you think? How are you liking your wall of omens? I started playing without them as I feel the slots were better filled. I don’t have my exact decklist with me at the moment, but I just feel they’re unnecessary. Also, I cut Think Twice for Glimmer of Genius. I feel that even though it’s more mana and doesn’t flashback, it’s simply more impactful regardless of the mana to cast it. At the moment I like them. I can understand not playing them, however with them maindeck it can cause the opponent to use their removal on those over Colonnades, and Snapcaster Mages.